Today I had to have my GDS. To prepare I was told I had to fast for three hours beforehand and no junk food. I usually have a bagel and orange juice for breakfast but I was worried about the amount of sugar in them. So instead I had an egg and cheese on an english muffin and some water. I also needed to have a urine sample taken, so I did that first. Then for the GDS you have to drink an orange sugar drink. Next you have to wait one hour before they take your blood. I was given a timer so we both knew when the hour was up and sent back to the waiting room. I felt fine after the drink but about 8 minutes until my hour was up I felt like I was going to faint. I hate that feeling. I mentioned it to the girl before she took my blood and she said it was normal because the sugar peaks about one hour after you drink it. They took two vials of blood and I was free to go. I felt fine for the rest of the day. Now I have to wait for my doctor’s appointment on Thursday for the results. This is the test I’m most nervous for so I really hope I passed. I would hate to need to take the longer test. I just got home from my second ultrasound for this baby. To prepare, instead of drinking 4 cups I only needed to drink 2 cups. I thought that was so going to be so easy, but I couldn’t even finish the two cups. The baby kept moving around and I thought I would pee myself so I only had about 1.5 cups. I think it was still enough though. This ultrasound was very similar to the anatomy scan I had at 19 weeks. 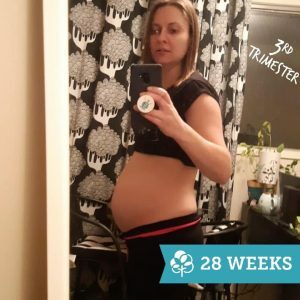 I’m now 28 weeks and I think they were just measuring everything to make sure he’s still growing as he should. The experience this time wasn’t as great as the first one for a few reasons. The TV screen I had to watch was beside me instead of in front of me so it was hard to see what was going on. And the pictures of the baby were harder to decipher what I was looking at. I think it may have been because he was moving around a lot this time. The ultrasound tech also didn’t explain things as she went like the last one did so I was trying to guess what I was looking at most of the time. This was also my first baby appointment where my boyfriend couldn’t come so that was a bummer too. The only thing I think he really missed though was her attempts to get a 3D picture of the baby. He was moving too much so he looked very creepy in 3D haha. I wish she would have given me one of those pictures so I could have shown him, but they were things of nightmares haha. She also mentioned that my placenta no longer looked low which is great. I think baby’s heart rate was around 153 bpm today.